Nutcrackers are small wooden dolls which carry a rich history with them. It was a German creation that acquired huge fame and eventually went on to become traditionally attached to Christmas. The nutcrackers are actually a group of an army of soldiers which is led by a king nutcracker. The first ever nutcracker was made of two pieces of wood, the people who created the actual nut crackers preferred to use ‘’boxwood’’ later on people in France and England adapted the same type of wood as well, The reason being that the boxwood was sturdy and strong some examples are the few ancient Nutcrackers that are still seen in museums. The miniature and precise carving done on these dolls, makes them more attractive and interesting, which is why they attained immense early fame. A fact that some of us are not familiar with is that the nutcrackers were use to crack nuts back in the days and that’s from where they attained their name as the nutcrackers. There is another confusion about whether they are action figures or dolls? Well It all depends on the eye of the beholder. These little wooden men who are also know in some parts of the world as sugar fairies have an interesting history, which starts from a small mining town in German called, Seiffen. In the 1800’s the miners who had a single mean of earning via mining, lost their only support and became jobless. In urge to get employed again they took advantage of their woodworking skills and started making different things from wood and they ended up making these small dolls called nut crackers. Their creations were transported to Dresden’s market where they all got sold out under a handsome price this was the start of the nutcracker trade. According to German traditions this army of small men made up of wood, brings good luck to home and family. Their work is to guard your house in order to protect them from evil spirits. Due to their strength they are able to face any sort of danger and act as a protector. When the wooden dolls accomplished gaining a well reputation, A German woodworker, Friedrich Wilhelm Fuchtner who belonged to the town of Seiffen in the year 1870 had a crazy idea and got inspired by these wooden dolls, he created a king wearing a crown similar to a miner’s hat. That’s from where the other wood carpenters started making soldiers and policemen. These nutcrackers acquired their actual fame in World War II when the soldiers returned to America they brought along these little action figures (Nutcrackers) from Germany as souvenirs for their homes and soon they picked off fame in America as well. With time these wooden dolls became symbolic figures in the community. In the year 1816 Peter Tchaikovsky came up with a cartoon story, The Nutcracker and the Mouse King, which rapidly became an immediate success. 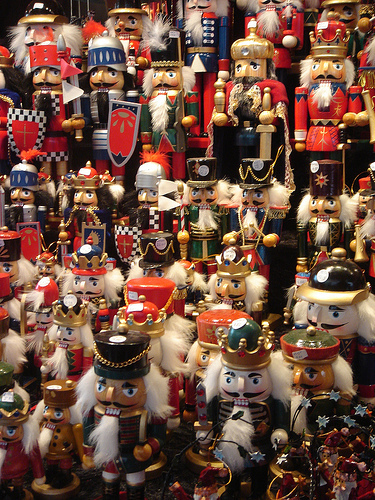 The traditional Christmas nutcrackers consist of an army of soldiers led by a King. According to the story ‘Nutcracker and the Mouse King’ there should be a prince whose name is Clara and the Mouse king known by the name of Drosselmeier and that’s from where they acquired their names. These days the collection of nutcrackers also includes famous personalities and people related to different fields like doctors, lawyers, policeman etc. These small wooden dolls have a size range from 5 inches to 36 inches and many people admire them a lot. On Christmas you will definitely see these dolls lined up on shelves or tables with the entire army just for the sake of decoration.